Papyrus is an open source scalable blockchain platform specifically designed to fight all digital advertising issues - fraudulent traffic, brand safety issues, excessive middleman fees, and the absence of supply chain transparency. Unlike other platforms, Papyrus offers a scalable solution, using blockchain technology, tailored to the digital ads market. SINGAPORE, April 17, 2018	(Newswire.com) - Papyrus is an open source scalable blockchain platform specifically designed to fight all digital advertising issues – fraudulent traffic, brand safety issues, excessive middleman fees, and the absence of supply chain transparency. It has unique features that make it a feasible solution for practical adoption – low transaction costs, privacy management, and execution of smart contracts based on large data volumes. Unlike other platforms, Papyrus offers a scalable solution, using blockchain technology, tailored to the digital ads market. 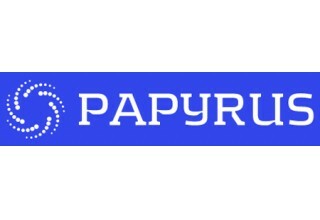 On top of its blockchain platform, Papyrus provides decentralized monitoring and money flow management tools for digital advertisers and publishers, which help them to get visibility on third-party partners and ad agencies, control money streams, optimize supply chain efficiencies, and give them the ability to counteract fraudulent activities. These tools cannot be manipulated by any parties: data for monitoring is stored immutably and money flow management rules are automatically enforced by smart contracts. For example, advertisers can enforce automatic rules that say, “Fraudulent traffic won’t be paid for and brand safety violations will incur penalties for abusers”. Verifiers connected to the system provide data to verify these rules while blockchain technology guarantees their enforcement. Papyrus is a neutral solution that doesn’t compete with ad platforms and service providers while bringing benefits for all of them (if they are not engaged in prohibited or fraudulent activities). Papyrus connects advertisers, publishers, agencies, advertising platforms and verifiers within the Papyrus blockchain network to create trust, fairness, and efficiency within the digital advertising market. 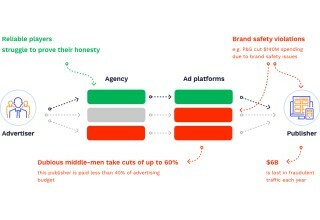 Using the Papyrus solution, advertisers can, at any time, check how much of their money each publisher has received, the performance of their ad campaigns as registered by ad trackers, and what fees were given to service providers such as ad agencies, demand-side platforms, and supply-side platforms. Also, advertisers can enforce their own anti-fraud and brand safety policies. As a result, advertisers have a clear view of all transactions and only pay for the services that they use. Privacy management to keep smart contracts and payment details secure, while publicly exposing aggregated information on the behavior of market participants, to establish their reputation. 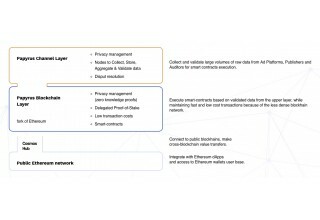 Papyrus has launched its MVP (pilot decentralized advertising ecosystem) that consists of an advertising network using blockchain architecture to enable the transparent purchase of advertising inventory. The MVP is deployed on Ethereum TestNet Rinkeby and will be launched in Ethereum MainNet in a few months. On April 9th, 2018 the Papyrus’ team completed the performance and stress tests of its MVP ecosystem with unprecedented results. The new technology allows for the processing of billions of advertising events as raw data with 16000 transactions/sec and memory usage of 800 Mb avg. CPU usage (channel node at stable throughput): 0.6 CPU and memory usage (IPFS node) of 1 Gb. These are impressive results that show Papyrus’ readiness for real integrations and pilot partnerships within the advertising market, which will start in May 2018. The platform is a game changer and will enable the industry to go through its next inflection point towards trust and transparency. It’s a new economy and the future of digital advertising. “Our vision is to disrupt the current online advertising landscape which, in its current form, is riddled with inefficiencies“, said Abeed Janmohamed, CEO of Papyrus. “Papyrus endeavors to transform online advertising into a highly transparent, consistent and lucrative domain for all the participants in the advertising value chain. Our strategy includes integration of our platform with existing market players, helping them to solve issues without competing with and replacing them. We think this go-to-market approach is faster and more beneficial than others. Providing market participants with a platform that will make them more efficient, Papyrus delivers real practical benefits. We believe that such an approach will result in a faster establishment of market presence and market share for The Papyrus project”. Papyrus is the world’s first fully comprehensive and highly scalable, decentralized ecosystem for digital advertising which radically improves programmatic advertising to provide an efficient, transparent and mutually beneficial environment for users, publishers, advertisers and decentralized application (dApp) developers, using blockchain architecture. Papyrus will ensure transparency, will be based on a reputation-system for all market players, will incentivize auditors to check for fraudulent activity, and it will be highly efficient; ensuring traffic quality, ad quality, and brand safety. Papyrus has been developed and is managed by a team of experts with strong backgrounds in building and scaling successful business processes in both advertising and blockchain technologies. For more information, please visit https://papyrus.global. Barger Tech, Ltd., announces the launch of BEST Plan - a groundbreaking holistic approach to improving livestock waste-management systems, which will eliminate the Open-Air Waste Lagoon and Spray Field method of managing on-farm waste materials in the state of North Carolina. Nebeus, a British FinTech platform used for the consumption and creation of financial services and products, has successfully sold 38% of the equity from its eagerly anticipated crowdfunding campaign, establishing itself as the world's first post-ICO crypto-project to sell equity via CrowdCube, the U.K.'s premier B2B crowd-funding investment platform. FEWtech, a platform that seeks to utilize blockchain technology to revolutionize and tokenize the multi-billion-dollar/day global agri-business ecosystem, has announced that its Token Generation Event's soft launch will be held at the Futurama Blockchain Innovators Summit in Ibiza, Spain.